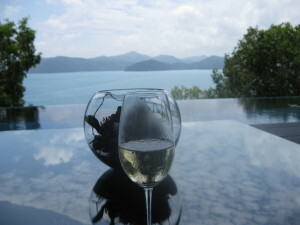 They’ve thought of everything and everyone at Hamilton Island’s qualia resort, even gym junkies like me who might struggle to forgo their daily fix of physical torture. Sweat and pain seem somewhat at odds with their mission to stimulate the sensory imagination but then perhaps that’s all part of the plan. Anyway, the gym at qualia is certainly not a gym as I know it. It’s a boutique outfit with a deck and a panorama over the sea. It’s a gym equipped with every distraction to speed you through your workout – music, television, water, fluffy towels, perfect bathrooms with exotic toiletries and stunning waterfront views of the surrounding Whitsundays Islands. And it smells of the sea, eucalyptus and exotic oils. 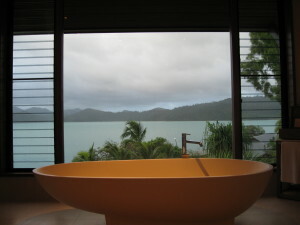 Hamilton Island’s qualia, which modestly (or is it defiantly?) eschews the initial capital, is queen of Australia’s luxury retreats. It was here that Oprah Winfrey and her inner sanctum took respite from their hectic Australian tour and from the hordes that followed them. 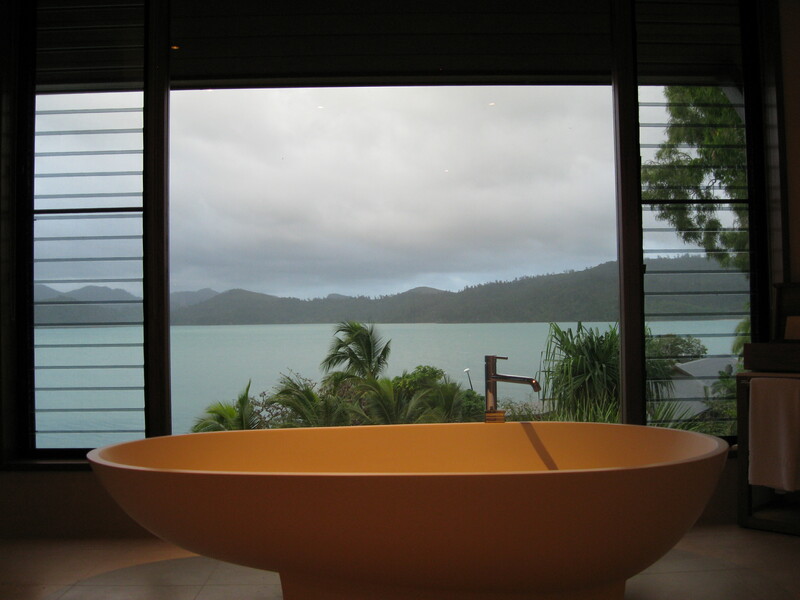 Qualia, which takes its name from the Latin for “a deeper sensory experience”, offers a ‘uniquely Australian experience … which inspires the sensory imagination”. Inspiration of the sensory imagination is apparently reserved for those over 16, as nobody under that age is admitted to qualia. Right now, this suits us perfectly. We’re besieged by under 16s, both on the home and the work front and our sensory imaginations have suffered as a comsequence. Our qualia experience begins at the airport arrivals door. It’s immediately clear that we’re destined for quite a different place from our fellow travellers. A tanned, smiling young man, with the distinct stamp of a Greek deity, greets us and shepherds us into the purring qualia coach. In our wake others grapple with trolleys and taxis. These things no longer concern us. We’re no longer of their world. We cruise past the township, past the marina, past dozens of puttering golf carts, past sauntering holiday makers, past swish beachside resorts, past grand hillside houses, but we’re not of that world either. Up and down hills, around corners we roll. Then almost at land’s end, at the northern tip of the island, we reach a tall, arched wooden door. It opens, as if by magic, then closes quickly behind us. On the other side, the road narrows and rolls on through a lush tropical garden of eucalyptus, palms, hibiscus, azaleas and bright green lawn. Mysterious little pathways lead away on either side. Words like Eden and paradise spring to mind. We come to a halt in front of a low, plain building of dark wood – Qualia’s Long Pavilion. When he designed qualia, Australian architect Chris Beckingham aimed to create “a luxurious Australian retreat that stimulates the senses and draws the outside in”. 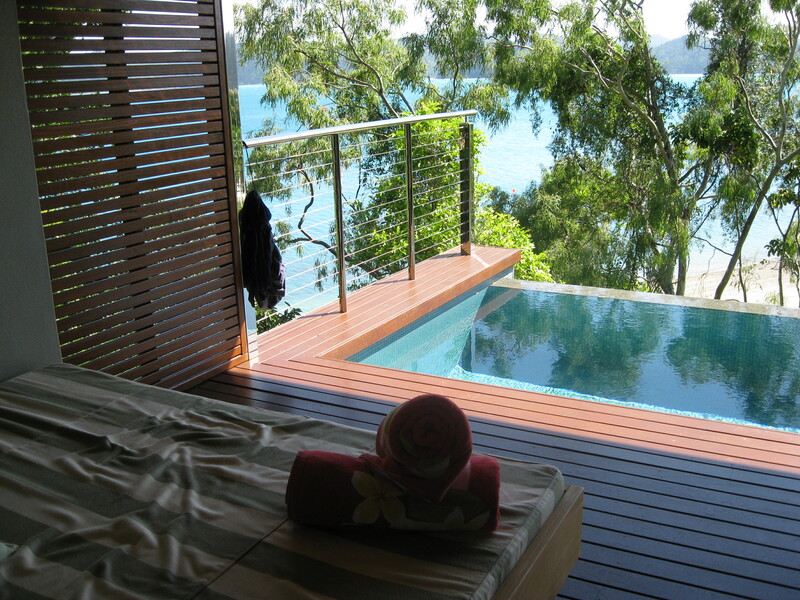 Qualia’s Long Pavilion epitomises that aim. We stand on the threshold, drinking it all in – gleaming wood, table tops that reflect the sky, broad inviting couches. 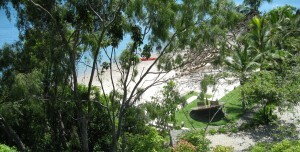 My eye follows a path of light across the polished floor, over an impossibly blue infinity pool, through a screen of leaves, over a stretch of turquoise sea to a fringe of white beach on a steep, bush-clad island. There’s the smell of wood, eucalyptus and the ocean. The deity installs us on a couch. Glasses of champagne materialise before us, while somewhere in the background, the business of the check-in goes on without us. Although the longhouse is Qualia’s H.Q and home to reception, the business centre, a bar, a library and a restaurant, it is restful and quiet. There is no discordant clatter of plates, no hiss of a coffee machine, no shrilling phone, no impatient click of heels. Here in the Long Pavilion, there’s only the sound of the water, the breeze in the trees, the call of an occasional bird and the soft ticking of cicadas. Time has already lost all meaning and we are lost in the view. Our glasses inch slowly down to empty. The deity re-appears. Would we like to retire to our pavilion?